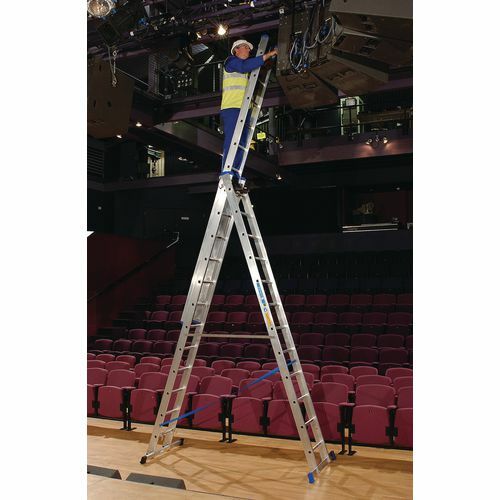 3 part, free standing ladder for maintenance in environments up to 7m high. 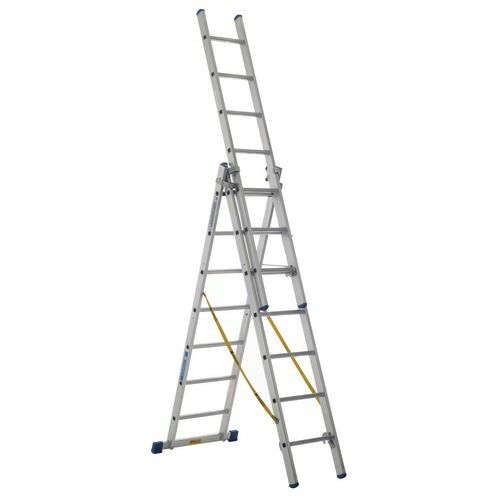 As a lean to ladder can be used at heights up to 10m. Certified to EN131 - 150kg load capacity. Upper ladder has parking hooks and lift off retainer. Replaceable plastic end caps ensure no risk of slipping. Getting access to very high up places can be difficult without the right equipment, maintenance work or painting and decorating can be especially challenging at point. The Skymaster large 3-section transformable ladders, from Slingsby, are adaptable to suit your task requirement, reducing the need for multiple pieces of equipment. These three part free standing ladders for maintenance environments have several different functions/variable positions, which can be viewed in the SlingsbyTV video (link below product images). They are certified to EN131 and have a load capacity of 150kg. There are six extended heights available; 4.1m, 5m, 5.8m, 6.9m, 8.6m or 9.7m. A wide horizontal stabiliser bar help to keep the user safe and replaceable plastic end caps ensure there is not risk of slipping. The upper ladder also has parking hooks and a lift of retainer. 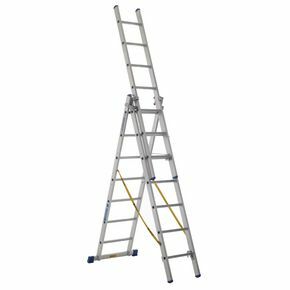 Our Skymaster large 3-section transformable ladders are versatile to help you accomplish your tasks efficiently and safely and they come with FREE UK Delivery.